Surprisingly, Prime Minister Boyko Borisov appeared in the role of spokesman for the notorious MP (and former Head of the State Agency for National Security, DANS) Delyan Peevski. Borisov said in a live TV interview that “Peevski is leaving Bulgaria”. He failed to tell us where Peevski is going and in what capacity – is this a private or a national mission, or who informed the Prime Minister about the intentions of the corpulent MP. While these questions keep intriguing the media and the public, tobacco manufacturer Bulgartabac is also quietly leaving. The machines in its factory are being dismantled and sent to an unknown location, according to pictures and testimonies of workers from the factory. According to sources of Bivol, the plan is liquidation of the entire production of Bulgartabac by the end of May, as the holding company will continue to produce cigarettes, but abroad – in the factory “Duvana” in Banja Luka (Republika Srpska) and in Dubai. Thousands of workers are threatened with layoffs, similarly to their colleagues from the already closed factory in Sofia. The liquidation will affect negatively tens of thousands of tobacco growers for whom this is the only source of income. Another machine is dismantled in the Bulgartabac factory in Sofia and is leaving in an unknown direction. Thus the owners of Bulgartabac, whom Bivol investigated in a series of publications – Bulgartabac Mafia 1, 2 and 3 – are hoping to get out of the focus of OLAF and European special services. The Holding became an item of interest after revelations of Turkish Customs and financial intelligence (first published in Bulgaria by Bivol) about large-scale smuggling of cigarettes manufactured by Bulgartabac. It turned out that it has long been possible for a manufacturer of excisable goods, which trades with notorious smugglers, to operate the European Union, thereby infringing European and international trade law. These times, however, seem irrevocably gone, so the owners of Bulgartabac directed their attention towards business outside the EU where they will not be so carefully monitored. Who are the owners of Bulgartabac? 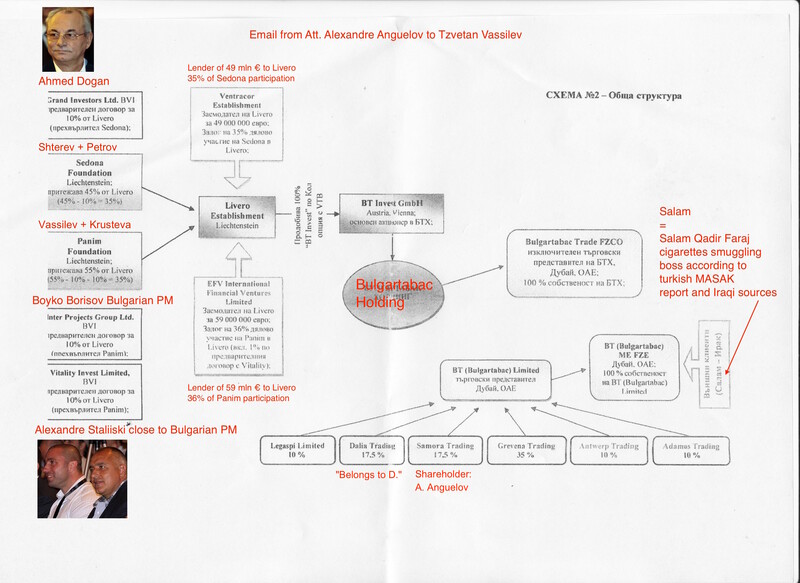 In February 2016, financial journalist Miroslav Ivanov published in his blog a correspondence between lawyer Alexander Angelov and banker Tsvetan Vasilev (majority shareholder of the now-collapsed Corporate Commercial Bank, CCB), where the “Lichtenstein” and “Dubai” structure of Bulgartabac is described with plenty of detail. According to these documents, the main partners in the holding company, through several offshore companies, are Delyan Peevski, his mother Irena Krasteva, Tsvetan Vasilev, the owners of “King’sTobacco” and of alcohol maker “Peshtera” – Anton Shterev and Atanas Petrov. Shterev and Petrov were later eliminated as shareholders and their place was filled by Peevski’s group. Besides them, three other companies appear in the scheme; they are registered in the British Virgin Islands and 8% of the shares in of the majority shareholding package of BT Invest have been transferred to them. According to information from a letter sent to the US embassy, which has been published only by Bivol, the “three” are controlled by current second-term Prime Minister Boyko Borisov, his friend Alexander Staliyski and Ahmed Dogan, Honorary Lifetime Chairman of Peevski’s party – the Movement for Rights and Freedoms (DPS). This hidden ownership was the cause of the political blessing to privatize Bulgartabac. Until now, the authenticity of the letter from Angelov to Vasilev (with a copy to Biser Lazov) was not confirmed with documents, although Bivol established that all offshore companies and foundations in Liechtenstein and the British Virgin Islands have been active at the time of the events described by Angelov. The available documents confirmed that all the companies from the Lichtenstein structure were using the same proxies from the law firm “Walch & Shurti“. The currently collected operational data give serious reasons to believe that the whole deal with the acquisition of the assets of one of the biggest Bulgarian enterprises is associated with colossal corruption, conflict of interest and criminal money laundering. – WHO and how financed the deal for the purchase of “Bulgartabac Holding”? – When is the Prosecutor’s Office in Bulgaria going to probe suspicions of Delyan Peevski’s involvement in the acquisition of Bulgartabac? – To what extend was Bulgartabac drained by its business representatives through schemes based on companies registered in areas concealing the actual owners? – Is the prosecution planning to investigate the company “Dahlia Trading” Ltd, whose ownership is attributed to Delian Peevski? – Is the prosecution going to probe information that one of the companies-owners of “Bulgartabac Holding” belongs to Peevski’s mother, Irena Krasteva? It turns out that the Russian VTB Bank was only an intermediary in the privatization of Bulgartabac. Even before the start of the privatization procedure, the Liechtenstein offshore companies have contracted a call option with VTB Capital. The money that was given for the privatization is not even Russian, and is of dubious origin. The Cypriot account of the local branch of VTB was used to have this money reach Bulgaria. The whole operation has a distinct money laundering flare. “Bulgartabac Holding” is the largest producer of tobacco and cigarettes in Bulgaria and until 1990 was a monopoly in the country. There are several attempts to privatize it in 2001, all of which failed, despite the interest of major multinational tobacco companies, including BAT, Reynolds, Philip Morris, Japan Tobacco etc. In 2011, the Privatization Agency initiated a privatization procedure for 79.83% of the shares. The consultant for the Agency was the London-based Investment Bank CITIGROUP. According to the requirements, only companies that produce tobacco and cigarettes could participate. However, not even one multinational company was producing raw tobacco, thus they were unable to submit bids. So in fact, the competition for the privatization was eliminated. The privatization procedure, however, allowed the participation of financial investors. Only one such investor decided to join the race – VTB Capital Pls, a subsidiary of the Russian VTB Bank. It bought 79.83% of the shares through its subsidiary, the Austrian company BT Invest GMBH. The price was by 100,000 euro higher than the minimum price of 100 million euro, announced by the Privatization Agency. According to publications in the press, tobacco companies, interested in Bulgartabac, such as the Korean KTG, were willing to pay approximately 250 to 300 million euro. By not allowing multinational companies to bid, the Privatization Agency and the Bulgarian government indirectly deprived the State budget and the taxpayers from a significant amount of money. It is obvious that the final owners, who have the power to dispose of State assets, created the scheme for their own purposes. They have benefited from this privatization on the account of Bulgarian citizens – because this was and is a crime. This scheme reveals the true buyers of “Bulgartabac Holding” and the origin and the path of the money for the acquisition. The mechanism was designed to conceal the true buyers of the 79.83% stake in “Bulgartabac Holding”. These buyers were also instructing the Privatization Agency, which sold the shares. These genuine buyers wanted to avoid any knowledge that they have acquired shares with serious conflict of interest, depriving the state of 150-200 million euro in revenues from the privatization, and to declare “modest” earnings. The company Livero Establishment, which is owned by the foundations “Belom” and “Sedona”, received 100.1 million euro from the future real and hidden owners. The possible origin of the money is their personal offshore accounts and loans from CCB obtained through Financial Ventures Limited, Cyprus. There was an agreement between the company Livero Establisment, Liechtenstein and the Russian commercial bank in Cyprus, according to which the Russian bank should invest money in the Austrian company BT Invest GMBH. Instead of returning money, the Russian commercial bank had to return to Livero Establishment shares in BT Invest GMBH after a determined period. Livero Establishment sent 100.1 million euro to the Russian commercial bank and it granted a loan to BT Invest GMBH in the amount of 100.1 million euro. BT Invest GMBH declared before the Privatization Agency that it had the necessary amount for the acquisition through a loan from the Russian commercial bank. This declaration satisfied the formal criterion specified by the Agency. BT Invest GMBH paid 100.1 million euro to the Privatization Agency and received the shares. This process is illustrated in a document, published first by Bivol, which is a framework agreement between the then-future privatizers of Bulgartabac and exposes their preliminary conspiracy to seize the Holding. Thus, the State was deceived that it was dealing with a banking institution, but the origin of the money – 110 million euro is completely different and probably criminal. This is an occasion to terminate the privatization contract and to fine Bulgartabac in the amount of 110 million euro, as provided by default in the event that the commitment to keep the scope of activity and the jobs is breached. Therefore, the owners of Bulgartabac are now rushing to liquidate the assets in order to have the State facing a fait accompli. The investigation of Bivol in Bulgartabac continues with documents on the ownership of Dubai companies in the scheme. These new data fully confirm what is stated in the letter from Angelov to Vasilev. We start with one of the companies in the Dubai structure – “Samora Trading”. According to the scheme, this company holds 17.5% of the stake of Bulgartabac’s sales representative in Dubai. On paper, it is owned the close-to-Peevski lawyer Alexander Angelov. This is about a stage in the scheme described in the accompanying letter from Angelov to Vasilev. The firms were recorded as property of the attorneys (Angelov for Peevski and Vasilev and Stanoev for the owners of “Peshtera”) and consequently there were various options for the real owners – either to use local Dubai dummies or to indicate other persons to whom the fictitious property should be transferred. It is also indicative that one of the directors of Samora Trading is Ahmed Elnaggar, who is also secretary of TGI Middle East FZE – the company that controlled the majority owner BT Invest until early 2015 and recently bought the shares of Peevski and Edoardo Miroglio in Bulgartabac Holding. Unlike the Liechtenstein company register, which is one of the most secretive in the world, Dubai is not a mission impossible to obtain data about the ownership in the companies. With whom could be Bulgartabac actually trading? Is there hidden ownership in Bulgartabac of smugglers in the Middle East? Expect new revelations of Bivol connected to the “Dubai Scheme”.